The latest gaze into the crystal ball puts the U.S. marijuana industry north of $24 billion by 2025. New Frontier Data, a cannabis market research and analytics firm, gave The Cannabist a first look at its 2017 annual report, which aims to track the long-term potential for the industry. The report acknowledges external factors such as federal rescheduling or a full-scale crackdown could shake up the near-term. By mapping out state-by-state sales to $24.5 billion in 2025 and projecting that cannabis industry employment could top 255,000 jobs within three years, New Frontier hopes to show that cannabis is not “just a flash in the pan,” said John Kagia, the firm’s executive vice president of industry analytics. “It’s very hard to look at both the numbers and associated economic dynamics and envision that this genie could be put back in the bottle,” he said. Such prognostication should be approached with a fair share of caution, some industry analysts and economists have said. This nascent industry is jam packed with unique factors, including varying regulations, disparate markets and lacking longitudinal data. So making predictions for eight months out, let alone eight years out, is a daunting — if not impossible — exercise, said Andrew Livingston, director of economics and research for cannabis law firm Vicente Sederberg LLC. Livingston noted two quick calculations he made for Colorado sales in 2017: one using a linear extrapolation of sales data going back to 2014 and the other using average year-over-year growth rates. The resulting numbers of $1.618 billion and $1.783 billion, respectively, were about $165 million apart. “This is a fast-paced, changing market with varying different dynamics that have more to do based on governmental and regulatory dynamics than they do on consumer dynamics,” Livingston said. 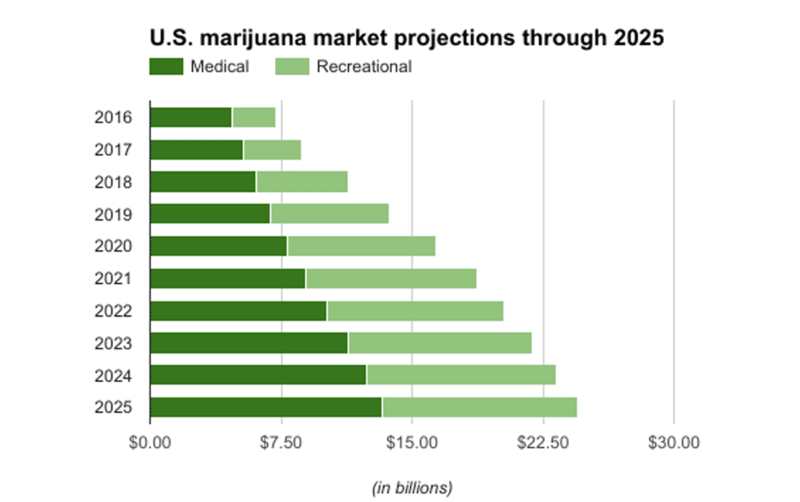 According to New Frontier, its researchers considered numerous elements in making their projections, including: changes in regulations, qualifying conditions for medical programs, what types of products are allowed, rates of illicit use prior to adoption of new laws, demographic trends, population growth, tourism levels and medical marijuana patient populations, among others, Kagia said. Researchers also obtained state-level data via public-records requests to examine patient numbers and cannabis business income statements. Neither the report nor Kagia disclosed the formulas used or the weight ascribed to certain inputs. “We realize this is such a dynamic environment that even minor changes do have substantive (effects),” he said. By 2025, New Frontier estimates that the more than two-dozen states with medical marijuana programs, and the nine recreational marijuana markets (including Washington, D.C.) should be fully operational, with the goliath California accounting for more than $6.59 billion — more than one-quarter — of the national sales. Colorado, the first state with legalized adult-use cannabis sales, is projected to reach $1.94 billion in medical and recreational sales by 2025, placing it fourth behind California, Florida’s medical-only market ($2.51 billion), and Washington state ($2.14 billion). Colorado marijuana shops had roughly $1.3 billion in sales for 2016, according to The Cannabist’s calculations of Colorado Department of Revenue tax data. 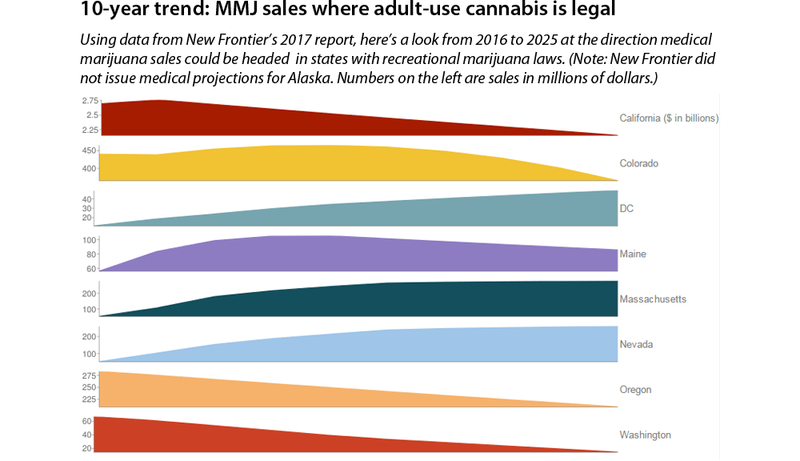 New Frontier’s eye on ’25 shows that some of the newly recreational states will see some negative pressure put on medical sales; however, medical marijuana sales will continue to account for more than half of the $24.5 billion market. New Frontier’s tabulations have medical marijuana sales increasing at a 13 percent compound annual growth rate to $13.3 billion in 2025. Recreational marijuana is projected to grow faster — at a 25 percent compound annual growth rate — to $11.2 billion, according to New Frontier. New Frontier also estimated that by 2019, the marijuana industry could be responsible for 255,000 direct and indirect jobs. The firm based its calculations on a 2016 Marijuana Policy Group report about the marijuana industry’s economic impact on Colorado. 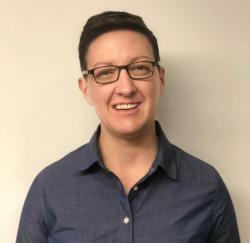 Officials with the Marijuana Policy Group have been critical of research methodology used to quantify the marijuana industry. MPG, in its Colorado economic impact report, claimed that the long-term forecasts made by New Frontier and others in 2016 “grossly overestimate” potential sales. MPG officials, in subsequent interviews following that report’s release, also expressed concern about New Frontier’s backing by venture capital firm Phyto Partners, which is investing in the cannabis industry. New Frontier has walked back some of its past projections. The U.S. forecast for 2020 — revised downward to $20.6 billion from $22.7 billion in September 2016 — and was lowered to $16.4 billion in the 2017 annual report. New Frontier’s report from last fall also pinned California as a $6.5 billion market in 2020. The Golden State’s projections now are at $5.6 billion for 2020 and $6.5 billion in 2025. Kagia attributed the adjustments made by New Frontier on the 2020 national forecast to medical markets such as Maryland, Ohio and New York not deploying smoothly; an expansion of the inputs going into New Frontier’s modeling software; and the presence of more data. Kagia also adamantly noted that his team’s research is conducted independently of Phyto Partners. And, to Kagia, the latest forecast is conservative. New Frontier’s 2017 forecast is based on the states with medical or recreational marijuana in the form in which they are currently legal. The forecast does not include states that could adopt legalization laws between now and 2025, or if there’s a breakthrough in research that triggers a major shift in medical marijuana policy, or the ripple effect from a nation legalizing marijuana, Kagia said. “It’s not hard to imagine that the total cannabis industry could be substantially larger than even our conservative projections,” he said. Larry Schnurmacher, managing partner of Phyto Partners, said his company had no involvement in New Frontier’s report, and told The Cannabist via e-mail that he sees a “tremendous” future in cannabis. “Much of the industry ‘commerce’ is not even accounted for as most numbers reflect end-user retail sales,” Schnurmacher said. He noted the marijuana and hemp industry ties to mainstream sectors such as technology; commercial agriculture as well as home and garden centers; business management; research and development; and capital goods and machinery, among others. “None of the numbers or the data currently available reflect billions of dollars in revenue, which will be added to GDP due to the growth and proliferation of the cannabis economy,” he said. Which states will become the leading markets? Using data provided by New Frontier, here are the top 10 states for 2016, 2020 and 2025.